Our training facility is located at 5222 Marsha Sharp Frwy., Lubbock, Texas. This is one block west of Slide Road along the north side of Marsha Sharp Frwy. on the access road. Our distraction-free facility is fully air conditioned, heated, and accessible to handicapped individuals. The flooring of our 2000 sq. ft. training area is matted to avoid injury or strain on our dogs and guests. In addition to our spacious training area, we have a large meeting room, offices, and a full line of quality training equipment. All of our classes are taught by volunteer members who are experienced problem solvers and have successfully trained a wide variety of dogs to obedience and agility titles. In addition to actively competing on the regional and national level, many have trained nationally ranked obedience dogs and successfully compete in other AKC events such as herding, carting, field, tracking, agility, rally, and conformation. S.P.O.T.C. offers a wide variety of year round classes to suit your training needs. Listed below are the classes we offer. PUPPY KINDERGARTEN: For puppies age 8 weeks to 4 months of age. Features house training, puppy care, socialization, sit, down, stay, come, polite leash walking, confidence building, deterrents for barking and chewing and much, much more! HOUSEHOLD MANNERS: For puppies over 5 months of age and adult dogs. (No dog is too old to learn manners!) Features sit, down, stand, stay, come, polite leash walking, socialization, and confidence building. Also problem solving techniques and much, much more. CANINE GOOD CITIZEN CLASS: This class is for those who would like to earn an AKC Canine Good Citizen (CGC) title on their dogs. 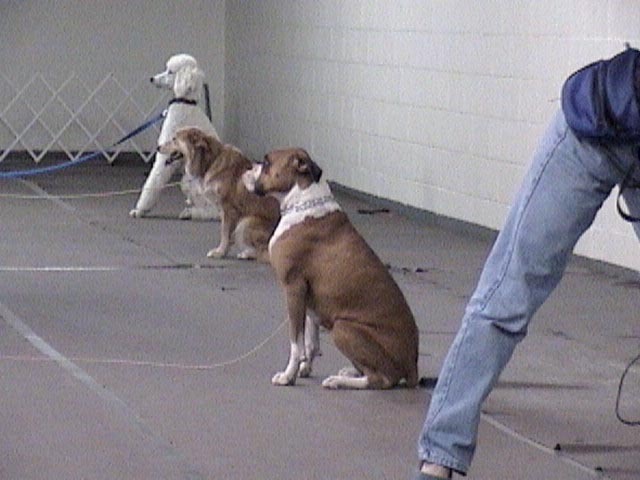 This class will teach the exhibitors to train their dogs to pass the 10 individual tests for this title. The test will be given at the end of the course. The class is designed for those owners interested in continuing to work with their dogs past the household class as well as those interested in doing Therapy Dog work. NOVICE RALLY CLASS: Training for preparation for AKC NOVICE RALLY trials. Classes are offered once a week for 7 weeks. Each class is 1 hour long. 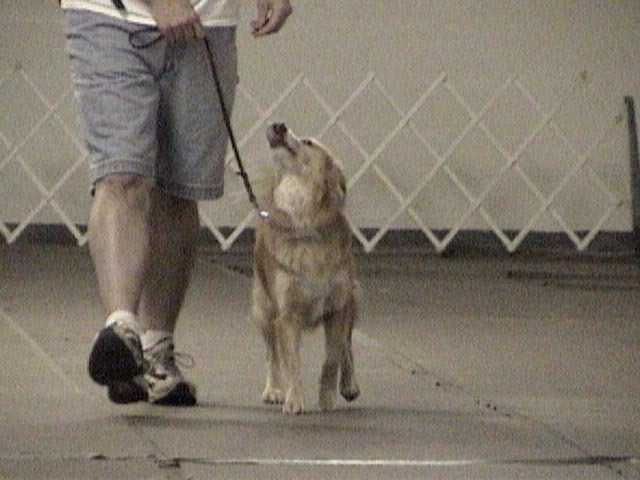 Rally is an Obedience-related performance sport in which dogs and handlers follow a course, at walking speed, determined by numbered cones and instructions for what to do at each cone �station�. Rally is less rigorous than Agility and more relaxed than formal Obedience. It is recommended that dogs undertaking this class are good on lead, as learned in the House-hold and/or Canine Good Citizen courses. --The sign up date of January 7th will be for classes starting the week of January 14th . --The sign up date of March 18th will be for classes starting the week of April 1st. --The sign up date of May 20th will be for classes starting the week of June 2nd. --The sign up date of July 22nd will be for classes starting the week of July 29th. --The sign up date of September 30th will be for classes starting the week of October 7th . ** Sign ups will be held at 7:00 p.m. at our training facility for all dates. *The cost for any 7 week course is $110.00. *Puppy, Household and CGC classes are held on Mondays evenings. Household and Rally Novice classes will be held on Wednesday evenings. All classes are 1 hour long. * Reminder: Please bring your dog's rabies vaccination certificate to the sign ups.